As with many Seattle stories, this one came about by way of the rain. One day in early December a drizzle came, and then it turned into a rare downpour. I saw this as an opportunity to see if I could truly be rendered impervious to rain by my new rain pants and rubber boots. I donned my boots, rain pants, and rain jacket, and then latched Remy into his over-engineered, three-wheel independent suspension, cup-holder-equipped baby isolation chamber—the idea of which I absolutely loathe—and covered it with its smartly-designed transparent rubber rain cover. Goodbye to Sheena, and Remy and I were off into the soup. We walked and walked, and I was so pleased with my rain gear that we didn’t turn back until we’d walked for an hour. On the way, we passed Shilshole Bay Marina, sandwiched between the Chittenden Locks where boats pass from Puget Sound to the lakes, and Golden Gardens Beach where I drop my crab pot on summer evenings. There in the marina was moored an attractive sailboat for sale, and on the back a sign with a phone number. I called the number on a whim, and that evening after the rain subsided the three of us went aboard. We unexpectedly decided then and there that this could be a thing. Not this boat, but some boat. I suppose we were primed for this decision by—and I’m somewhat ashamed to admit it now, as it seems a betrayal of our priorities— our attempt to buy a humble two-bedroom bungalow just a few weeks prior. We had put in an offer at $103,000 above the asking price—for a humble two-bedroom bungalow!—and still were not the highest offer. Jibbers Crabst almighty was trying to tell us something. 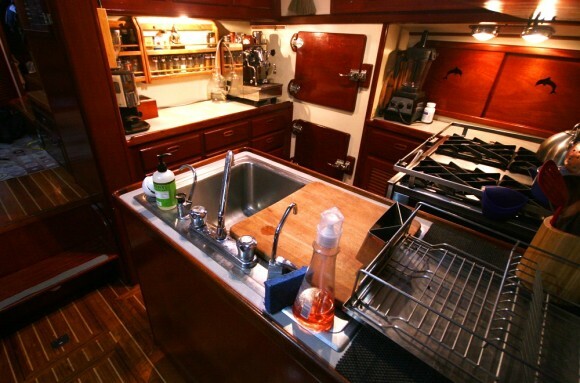 A few days after looking at the first boat, we scheduled a visit to check out a sleek Beneteau sailboat with a large, clean interior and lots of flashy chrome and wood bits. We sat inside with the broker, a benevolent lifelong sailor, extremely well admired in the sailing community, and we asked him what he thought of it. He was silent for a moment, then squinted and sighed. “Don’t buy this boat.” He said. You could see his inner sailor battling with his inner salesman. “It’s real pretty, and would be nice for entertaining guests and putzing around on weekends, but this thing couldn’t handle the blue water. These little lightweight boats get tossed around and it can get pretty miserable if you plan to spend any significant time at sea.” I envisioned myself dry-heaving over the shiny chrome railing of this lightweight fiberglass showpiece somewhere in the middle of the Pacific without anywhere to go but deeper into seasickness hell. “If you want something for blue water sailing, I can show you a bunch of different boats for that. One comes to mind, but it’s really more of a ship than a sailboat. Fifty-four foot steel hull, and systems like a battleship. It’s more boat than you want, but you could look at it just to see the other end of the spectrum, then we could find something in between.” More boat than I want? He obviously wasn’t privy to my tendency toward overengineering. 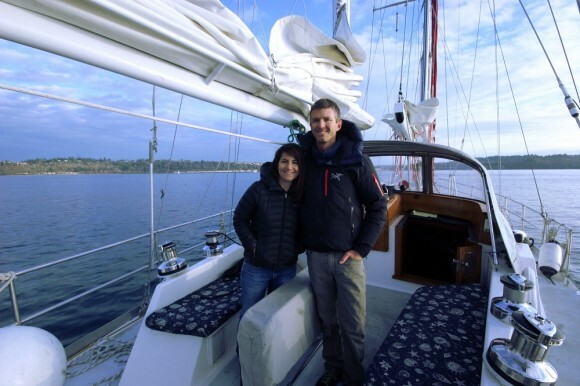 The next day we met the broker back at Shilshole and he led us to the boat—it wasn’t frilly or flashy like the Beneteau; it was the Nacho equivalent of sailboats: outfitted for big, rough seas, blue water crossings, and self-sufficiency. Built of steel instead of fiberglass, it was fifty-four feet long with a 17-foot beam, and weighed 70,000 pounds. Its keel held 18,000 pounds of lead shot as ballast. Nothing would turn this boat over, and it wouldn’t be tossed about like a toy in the weather. 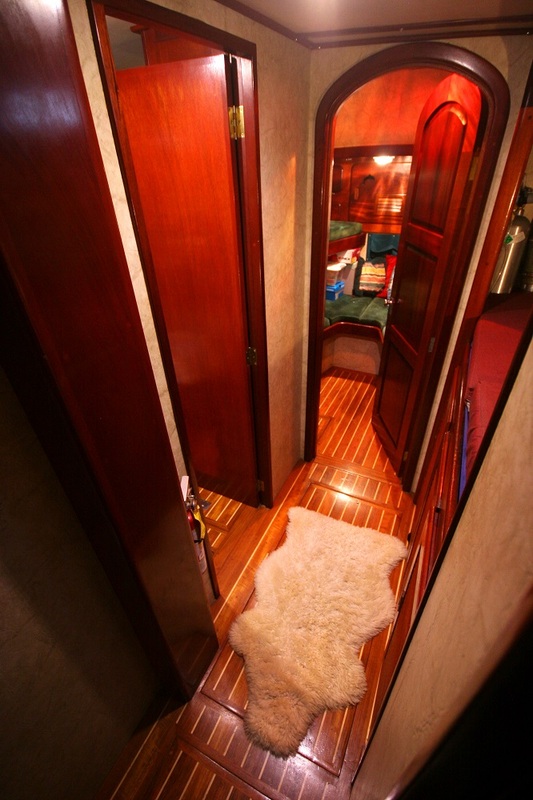 It had a well-equipped galley with a commercial gas range, two bathrooms, and enough beds for twelve people spread between its two state rooms, v-berth, and various bunks. 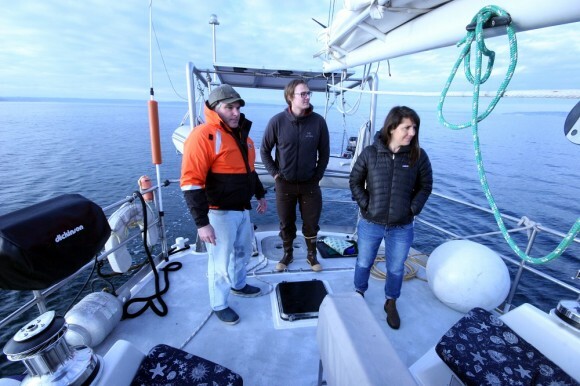 With a 750-gallon diesel tank, two masts, 400-gallon fresh water tank and watermaker, survival suits, eight anchors–each with its own specialization, diesel heater, solar and wind energy systems, and storage for months of provisions, this was the epitome of expedition sailboats. It also came with a pretty unbelievable backstory—and some big shoes to fill. But rather than jump into that story now, I’ll leave you in suspense and save it for the next post. When we stepped aboard, Sheena and I looked at each other and immediately knew that we’d found home. 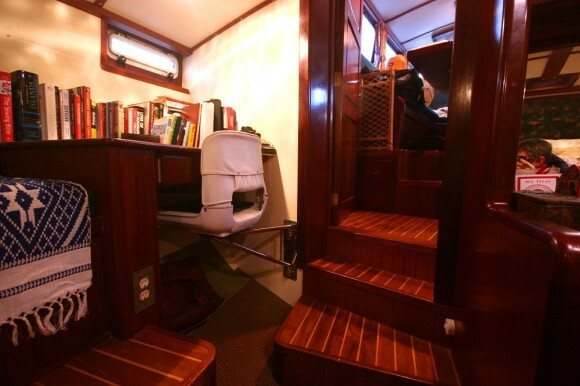 While it was built like a tank, its mahogany interior was warm and inviting. An expedition-ready boat where we could also raise a family. The galley would feed Sheena’s love for the culinary arts, and the expansive engine room chock full of systems would keep my engineering spirit satiated. 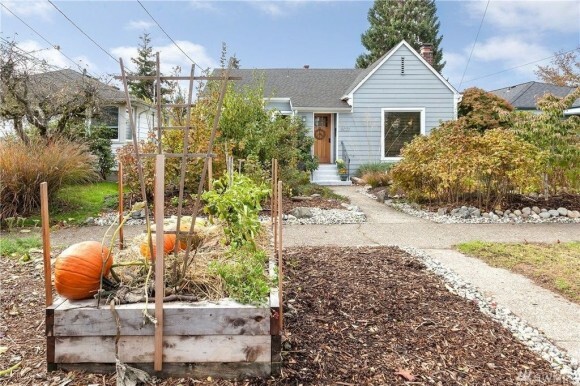 We made an offer shortly thereafter, which the seller accepted, and we took possession a few days ago. And just like that, we no longer live on American soil. And now I sit writing this post from the desk you see in the last picture and I couldn’t be happier. Sheena tenses up and squeals whenever she remembers where she is–she has clearly forgotten all about Turkey. 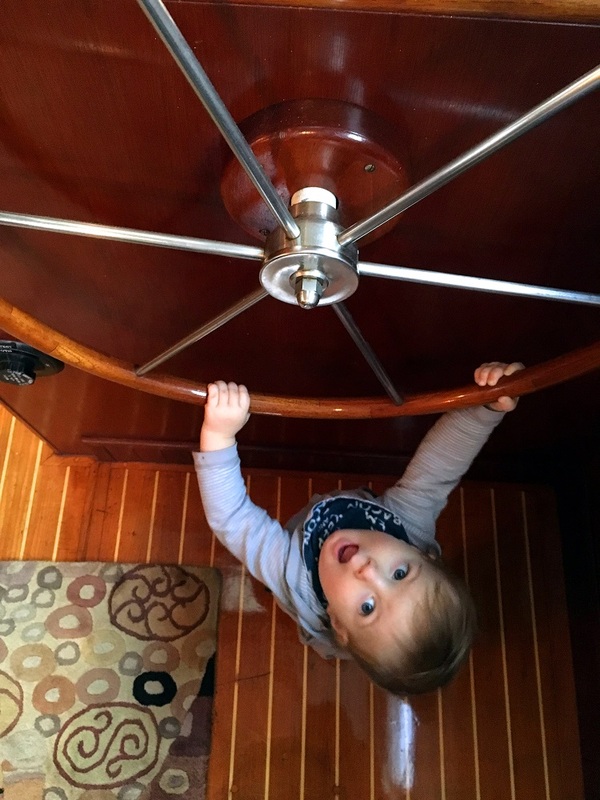 And Remy loves all of the nooks and crannies, having his own room, all of the stairs to climb, pressing the buttons on the nav equipment, and the little rings that flip up on the floor to gain access to the boat’s nether regions. The learning curve will be steep, we can fully appreciate that. But how boring life would be if we only did things that we already knew how to do. And so here begins a new adventure! WOWZER, y’all are off on the Next Adventure! After what you’ve just done, it just didn’t seem right that city life would suit you for very long. If you start a new blog for your sailing life, be sure and add me on to the list. Can’t wait to hear what comes next, congratulations! What a change! From a VW to a big boat… Good for you guys. Let the adventure continue!! Never heard of it, Skip, but we’ll keep an eye out for it. Thanks for the tip. Very cool. We just moved to the Seattle area a few months ago and sailing was one of the reasons. Enjoy and can’t wait to hear what you’re planning on doing with such a big boat. So incredibly psyched for you both and Remy!! It only makes perfect sense, like the only logical next step! Ya’ll got seven seas to sail!! Incredible! Congratulations on the purchase of your new home! Beautiful boat, can’t wait to see where life takes you! Now that’s a boat! Would love to hear more about it. Awesome!!! Can’t wait to read your next blog (then buy your next book). Wow, Brad. Really amazing. You’ll have to sail over to Turkey and visit Eileen, or to Japan to say hello to Will or to NYC to touch base with Nick! Wow, what a perfect fit for you guys! After living in Nacho this must seem expansive! Can you give us more details as to what model it is and such? This…Is…Awesome! Congratulations!!! Had to feel a bit unreal to take possession of that glorious beast. WoW! so excited for you guys! Love your attitude towards life, living with no regrets. Can’t wait to read about new adventures. Wow! Life on the ocean & it’s learning curve, good luck! Ought to be some ride. I watched that 4th Jason Bourne movie, the one without Jason Bourne in it… At the end they are on a boat, the family lives on the boat and they had a chicken on the boat.I thought about that, thought about it hard… your home, family, everything including chickens on a boat… a whole different world. Good luck to all of you and as you’re learning about boats, the sea & everything else remember to never turn your back on the ocean. Never. Good for you! Keep up the posts on this adventure – there are a LOT of people who want to see what it’s like! you two (make that 3 now) continue to amaze me! Keep up the adventurous spirit and congratulations on your beautiful new home! OMG that is awesome, and I’m so excited to resume reading your posts again ,with a fresh set of adventures. Good luck! 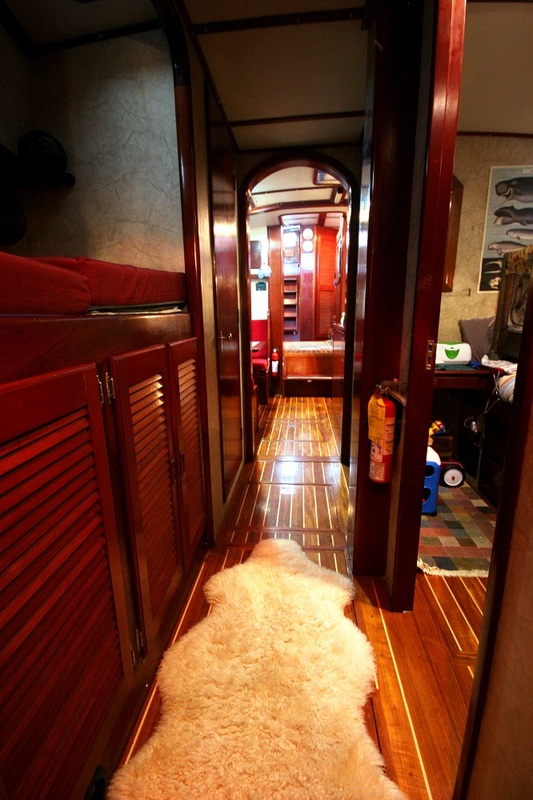 “Warm and inviting” doesn’t even BEGIN to describe the living quarters of this “ship”! I feel so grateful that I was able to spend Christmas in your new home with you….only 5 days after you moved in! Yes, folks, there was even room for a brightly lit Christmas Tree! Being inside your home made me forget that I was actually on a boat. Emerging onto the deck from below was amazing: from the warmth and serenity of the quarters below, to the blast of the balmy sea breeze on my face was exhilarating! Your lifestyle—in keeping with your principles and priorities—has always been an inspiration to me. Did you sell Nacho ? Might check with Bumfuzzle … a couple and eventually two kids who lived on two different boats and sailed the world. Congrats and welcome to the world of sailing! Last year I made a similar leap and now the owner of a 40ft blue water cruiser! With no experience piloting anything bigger than a 13ft day sailer, it was a huge learning curve. But, with the help of a few very capable sailing friends, I am now able to handle the boat single handed. There are tons of resources out there which I’d be happy to share. If you keep the boat in shilsole, you will be in good company. Feel free to contact me. We’ve already come across S/V Delos, and have been watching clips on YouTube before bed. Great stuff there! Glad you caught the Jibbers reference. Not sure how many are familiar with our Mr. Oats. The prior owner was able to single hand this boat as well, which gives me hope. If you’re ever in the neighborhood, feel free to drop by. Beautiful boat! We have never sailed before and are planning on buying a boat in San Carlos or La Paz, México. We’ll be sure to read your blog to learn from your successes and failures. Happy sailing! Maybe we’ll meet each other on the ocean blue someday soon! Would love to know the what sort of boat this is– It’s beautiful!! Great purchase! I have been sailing for 50 years, both racing and cruising. My favorite time is out of sight of land, in blue water. That boat looks like it will handle anything and move icebergs aside. Love the double headed ketch rig (is it a ketch). It should be easy for you two to handle, especially when the built-in crew grows a bit. 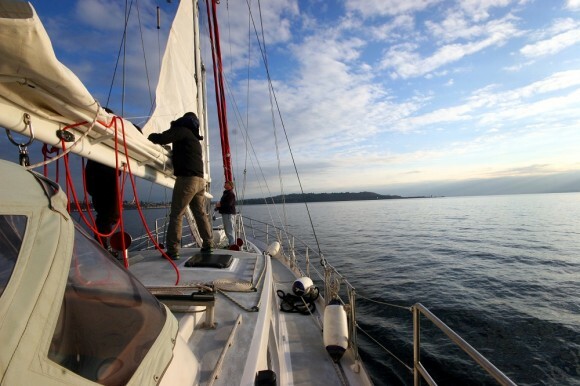 Puget Sound is the perfect place to learn and get your search legs. Have fun! Sorry…I meant sea legs. Those are good sized winches too! Don J. Excellent. Looks very seaworthy. Bumfuzzle x10, and in reverse. We had our boat (C&C 33-Stampede)moored st Shilshole Bay marina for 3 1/2 years in the Kate 70’s before getting a slip at Portland Yacht Club. We were weekend warriors and religiously made the drive up every weekend. Great memories. Are you moored at Shilshie bay? I remember the crab pot full every eeekend. Outstanding purchase!! 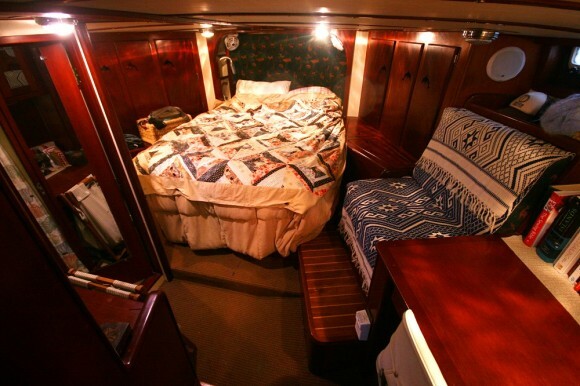 Another resource for you two may be this couple who lived and sailed fulltime for a few years before giving that up for RV land based living. Oh my god!! Remy your parents are officially nuts! climb out and go to the road and stick out your thumb with the cutest look on your face you can muster!!! RUN!!! Nah, just kidding…. there is no better way to live I think. You guys did it! And looks like you ended up on a good one! 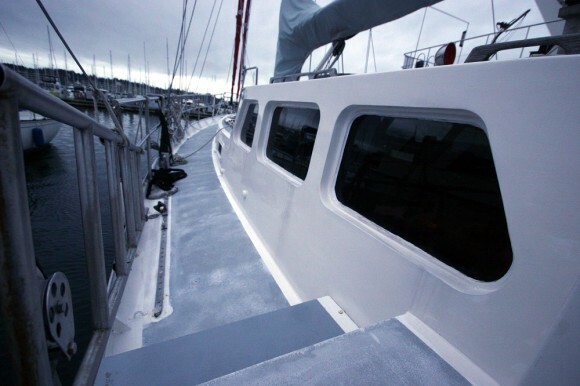 We extend the offer of information on how to fix or protect, refinish a steel hulled boat. We have not owned one but we have rehabbed a couple with friends and lessons learned are good ones to gleen off of. Chuck has had a few bigger boats as you have there. and he could be of some assistance online or phone. He also has many years as a mechanic/supervisor when it comes to engines. Especially diesel. drop us a line as we a couple years from retirement… if we get that far … and are rebuilding our own little boat which we will go that far to do!! We connected before. Had lost one your size to a triple storm a few years back. Don’t ever assume it can’t flip. But with proper prior preparation you will prevent piss poor performance and be all good to take calculated safe voyages just fine. Seriously though, nice move. You guys will love it I bet. Pick our brains for anything… we may know or we likely will know the right person who will know. 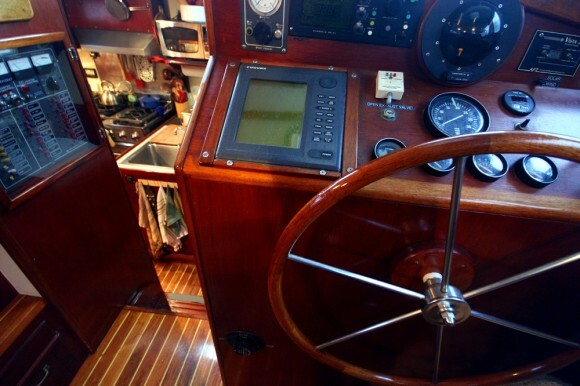 Ive been sailing since a kid… long time ago and lived most of my life on boats. Ha! I am in so much denial about us finishing the last two years till full retirement that the sentence I used in my previous comment made no sense! again we’re proud of you two for really living life true and to your path together! Its an awesome thing! onward! connect for any insight and we are all yours. Hey just wanted to share my enjoyment of your exploits. I am a confirmed vanagon man too and I also have a boat in Shilshole. The renovations on your van are awesome. The boat looks sweet too ! We first came across your blog through a loose association with Shrader. Good luck with your adventures, maybe we’ll see you sometime down at the docks. We’re on P dock. Right on! 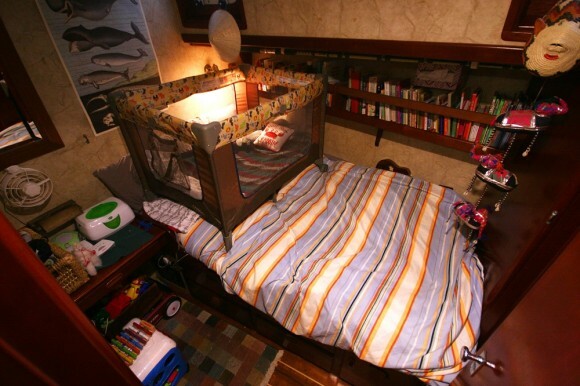 Welcome to the live aboard life! It is seriously the best, even in the rainy northwest. Get the blue Ikea bags because you have now entered a live of being a sherpa. Don’t forget to fill the tanks before a freeze and the port turns the water off. It would be wise of you to empty the head at this time too. Never put yourself in the position of needing fuel on a busy holiday weekend when all the people who don’t know how to drive a boat are trying to drive their boat.. Also, get good at driving that BIG boat. Yikes! :) Get the StatePark Marina pass, for prob less than $200 a year you can stay at any marine park (theres about 40) for at least 3 nights at a time. Finally all kids who stay aboard the boat must watch Captain Ron annually. Also, I don’t suppose I could get you to NOT do rad blog posts about how rad it is to live on a boat therefore driving up marina prices, anchorage fees and making empty bays in the Salish Sea more crowded? Can you at least off set it with extensive discussion of mold, the smells of the head, claustrophobia and the never ending long list of boat chores? Please? We used to live on our sailboat, Odelay in Shilshole now we live in Everett and have been livaboards for 5 years. And our VW Bus’s name is Bessie Loo. Welcome to the nautical neighborhood. Then I remember that we’re talking about making a boat move five miles an hour through water, and yeah, anybody can do that. Have fun. You guys will do great. You’re a team. Have fun! We’re super happy for you, and can’t wait to see you cast off the dock lines. Yes, it’s a ketch. Good eye! Next blog will be all about the boat. Yes, we’re moored at Shilshole. You drove up every weekend from PDX?! Wow! Thanks for the offer of advice–we may take you up on it. I remember a few times when I was up to my elbows in grease and popped open the laptop to seek troubleshooting advice from TheSamba or friends online when Nacho had his woes. I would pose a question and then just stare at the computer or thumb through the Bentley manual until the answer came to me. And wow, you lost a boat to a storm? Sounds like a great story! I hope to see you around; feel free to drop by some weekend for a beer or bbq. Shoot us a message sometime. Everything is completely rosy, we don’t have claustrophobia, and our loos smell of fine tarragon and the grasses of the Spanish Alpujarra ;) At any rate, if our blog is able to drive up marina costs and fill the bays of the Salish Sea with the previously uninitiated, then we will know that we’ve truly made it as writers! 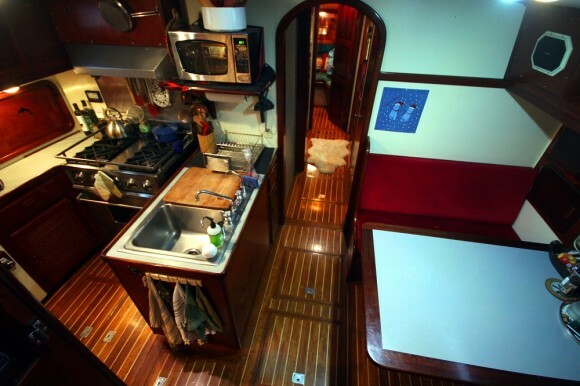 A cruising sailboat is just a Vanagon without wheel bearings (something to appreciate). The two are connected by some unseen mechanical/genetic common genetic thread that reaches out to certain special people and leaves the rest untouched, confused and nervous…like something from an X-Files episode. Enjoy the boat, build a bike rack, go see what you missed the first time round and come back to Nova Scotia. Wow. You guys. You are hella-awesome. I cannot WAIT to hear more of your adventures (hoping I will be emboldened to syphon off some of your AMAZING “can-do” attititude). Congratulations on your new adventure!!! Makes me wish I were younger. Did the van trip via you guys and now this! Just Great! 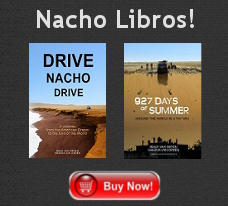 Well, since I have “Drive Nacho Drive” and “927 Days of Summer” on my night table, I had better get them read cuz I sense a NEW book coming!! Since we live in White Rock BC and the ocean is our back yard, we envy you all. Have an amazing adventure and good for you guys!! I’ve read your adventures with Nacho and starting your second book. Love how you write.And envy your life. Im going to be traveling a similar route and will be using your adventures as a reference. I’m awaiting seven years to be released from the Army (retiring). Then I’ll be overlanding with my own little beast to Usuhia and if my jeep can make it to the very tip of South America then it may be the first car there. Becoming a certified sailor is also on my list. I sail with a friend out of Annapolis, MD. 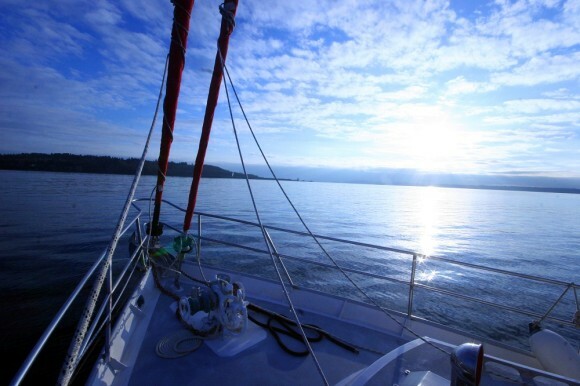 Check out this sailing course website. Its free. Look forwards to reading your future adventures. Waiting for the next installment here! You two (three!) are an inspiration! Love and hugs from CO… I miss you! hello !!! Des de Barcelona !! one question… And Nacho?? sold??? 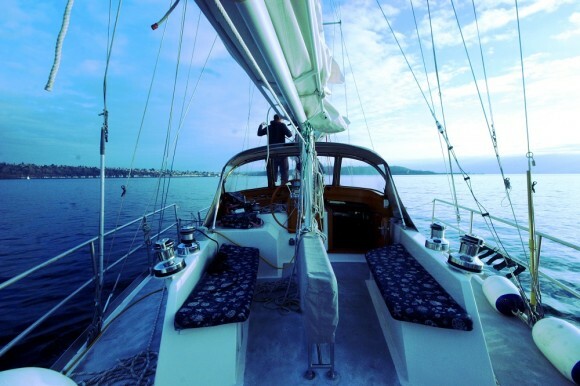 another question… sailboat for weekend or travel around the world? ?